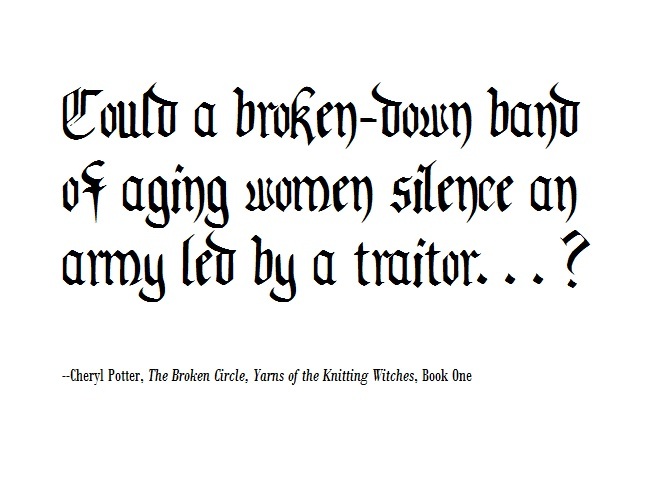 I receive quite a few pitches to review books, but when I received a pitch from Hunter Hackett with a book about knitting witches, I was intrigued. 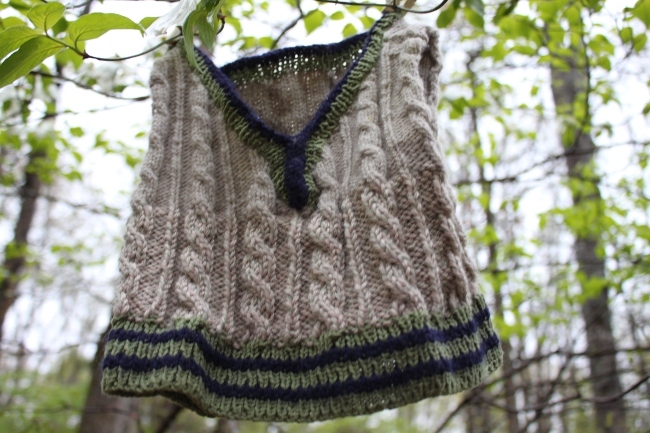 Knitting was my salvation during my diet and exercise experiments this spring. 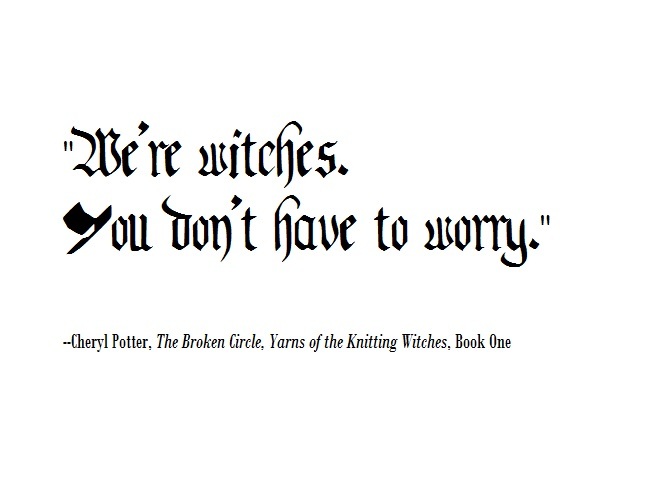 So being a sort of knitting “witch” myself, how could I refuse? 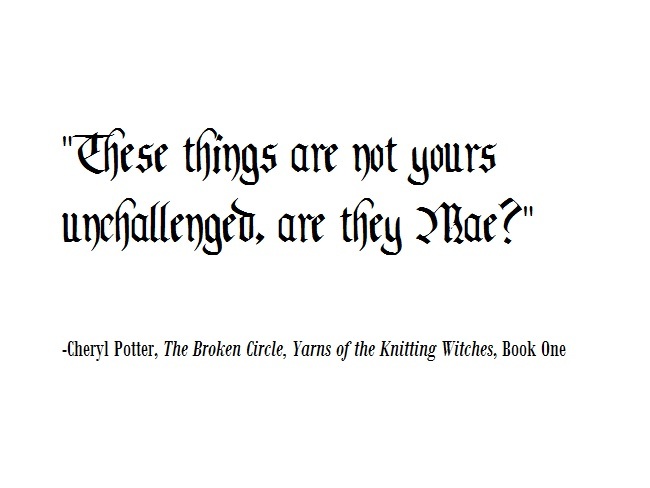 The Broken Circle: Yarns of the Knitting Witches is the first in a trilogy of books by author and fiber artist Cheryl Potter. Ms. Potter founded Cherry Tree Hill Yarns, selling unique knitwear designs and custom hand-painted yarns. Anyone who makes things with their hands believes that their work imparts a sort of “magic” into the finished product. When you touch something handmade you can feel a bit of that magic—the love and care that went into it and the creativity and uniqueness of the maker. Handmade things make us feel special and indeed perhaps a little magical. Ms. Potter’s book takes that concept and expands it one step further…what if those handmade garments really were magical? Ms. Potter has created an entire world, worthy of Tolkien comparison. There is a detailed map and geography to her setting and a deep historical backstory. There are 12 unique knitting witches, as well as many other characters as well. I am not always the best at keeping track of such details in novels and was a bit intimidated to begin this tale. However, once I got started, it was truly hard to put the book down and 361 pages seemed to fly by. Ms. Potter has skillfully avoided the two dangers of writing a novel about witches. The magic practiced in the book is not dark or Satanic nor do the witches say corny spells. The witches are sort of like skilled chemists or professors, which makes them fascinating and complex. As the story progresses, at the end of each chapter are patterns that you can make to bring the world of the knitting witches into real life. The patterns can be purchased in a separate companion pattern book or individually through her website. Skye’s Traveling Cloak is currently very high on my to-knit list. After you read the book, however, you feel that such garments cannot be made of anything except hand-dyed (and maybe even hand-spun) yarns. So, I have to wait until I have a worthy yarn in hand. 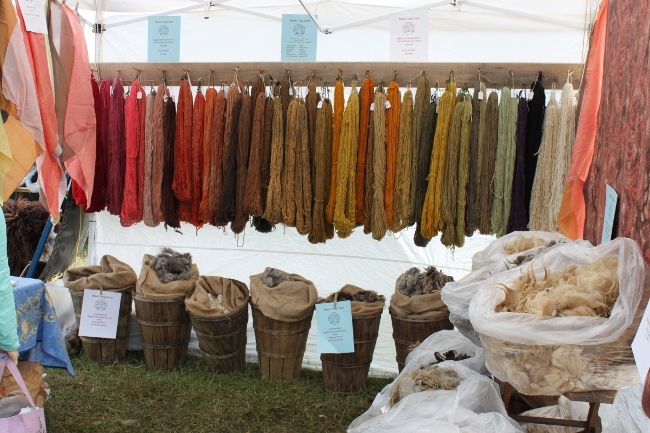 Perhaps a find from the Virginia Fall Fiber Festival this fall? I will never think of fiber festivals the same after reading Ms. Potter’s description of the Middlemarch World’s Fair. If you are thrilled by this display of yarn from Black Twig Farm, you may be the target audience for Cheryl Potter’s latest book. The book itself is a work of art. The pages have a thickness and weight to them that made me remember why I love reading real paper books instead of e-books. Each chapter has gorgeous calligraphy at the top with a subtle detail hidden in it, like a raven or a small cauldron. The illustrations by artist Frank Riccio are superb. Clearly someone loved doing the layout. Do you own things “unchallenged?” Is there someone else who owns them or could make better use of them than you? What a good question to ask ourselves when we are evaluating whether keeping something around that enhances our lives? You don’t have to be a knitter to enjoy this book, but it certainly helps. 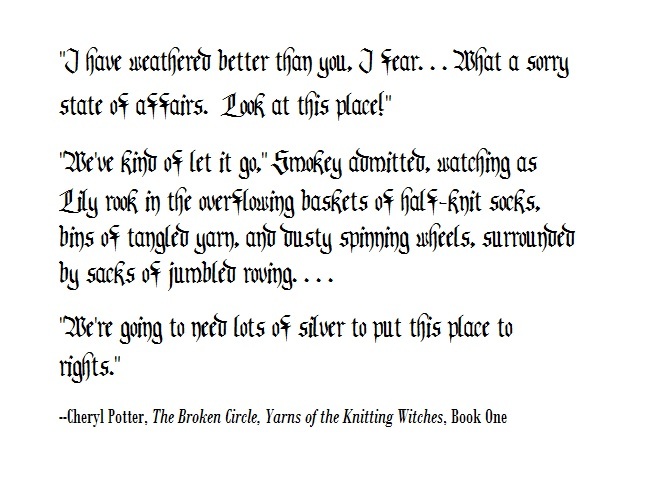 There are many knitting-related references in the book. The book also skews toward a female audience. The witches are strong women, who may not be perfect, but have the confidence, sense of humor and wisdom gained with age. Some are a bit salty. Some will remind you of a mother or aunt in your life. They are all quite lovable. 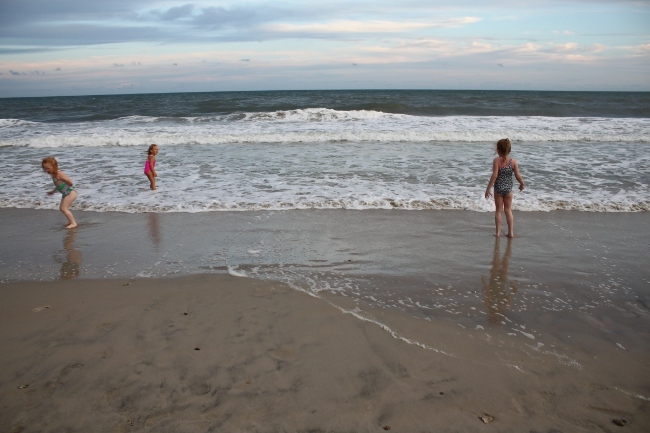 Interwoven with the witches are stories of young adventurers, both girls and boys. 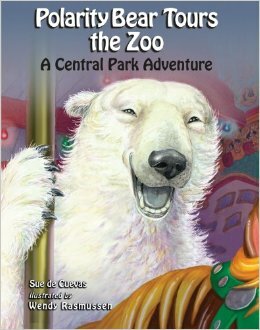 The reading level for this book would probably suggest a minimum age of around 10-12. Some of the vocabulary had me checking the dictionary. Some of the words sound made-up but are real English, like mayhap and fossicker. Children who love Harry Potter will find this a worthy successor. There is even a reading guide you can download for free from her site for students and teachers (or homeschoolers!) to use. Overall, this was just a delightful find. It was the perfect read during our stormy June weather. I am honored to have been chosen to review this book and await publication of Book Two. 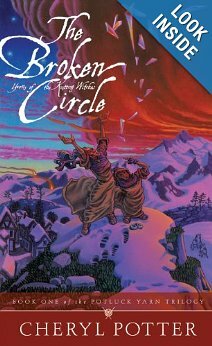 *Disclaimer: I received a free review copy of The Broken Circle and companion knitting book.